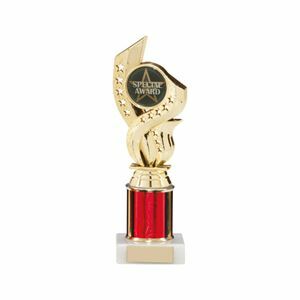 At Impact Trophies & Medals have a fantastic range figure top snooker trophies designed to celebrate and mark and snooker tournament or club achievements. our extensive range features a choice of glazed plastic figure tops, each compatible with a choice of column and marble bases, creating as award that is sure to meet your snooker presentation needs. 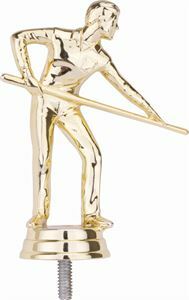 Impact Trophies & Medals are a leading retailer of figure top trophies for snooker. 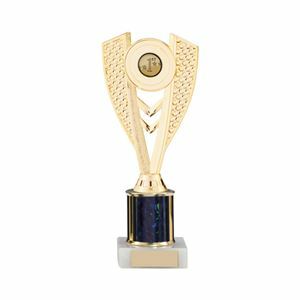 Great for personalisation, many of our figure tops are compatible with a range of different coloured bases as well as each being supplied with a FREE self adhesive text plate for the base of the trophy. 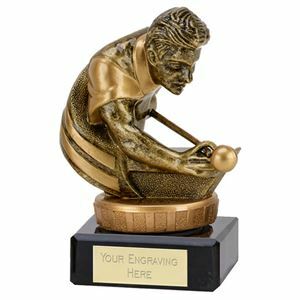 Great for pool, snooker or billiards, the Pool/Snooker Trophy Figure Top is a high quality plastic figure top available in metallic, antique gold and silver finishes. 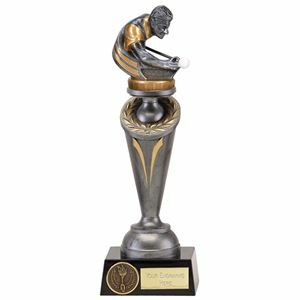 Featuring a male player leaning over a table with cue in hand, this figure top simply screws into your choice of trophy base to allow you to create a figure top trophy perfect for your event. The Classic Flexx Snooker/Pool Trophy is a small plastic trophy set on top of a square black marble base. 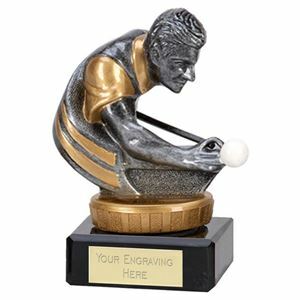 This stylish trophy is made from high quality painted plastic and features a male snooker player holding a cue which is about to strike the cue ball. The Classic Flexx Silver Snooker/Pool Trophy is a small plastic trophy set on top of a square black marble base. 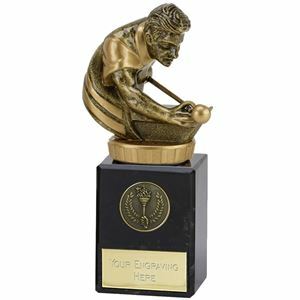 This stylish trophy is made from high quality painted plastic and features a male snooker player holding a cue which is about to strike the cue ball. Perfect for a pool or snooker competition at any level, this award would make an attractive addition to any trophy cabinet. Made from premium plastic, a figure holding a cue is positioned on top of the column and glazed in a gold lacquer. The column is coated in a sparkling foil effect and is available in a wide range of colours. The Pool/ Snooker Figure Top Trophy is set on a solid marble base for a premium finish. The Classic Flexx Pool / Snooker Silver Trophy displays the top half of a snooker or pool player taking a shot. The figure is cast in fine detailing of his features and is made from premium plastic and coated in antique silver with shiny gold trim. The trophy's base is made from solid black marble and provides a circular inset for a logo and can be supplied with a FREE engraving plate. Mounted on the solid black marble base of the Classic Flexx Pool / Snooker Gold Trophy, is the top half of a snooker or pool player with cue and ball. The 3D figure's features are cast in fine detail from quality plastic and coated in an antique gold and shiny gold trimmings. Made from premium plastic and set upon a black base, the Crucial Flexx Pool/Snooker Trophy will meet all of your snooker or pool trophy needs. Set on a tall slim conical riser with gold detailing, the silver trophy topper displays a male pool/snooker player leaning over to strike the cue ball.